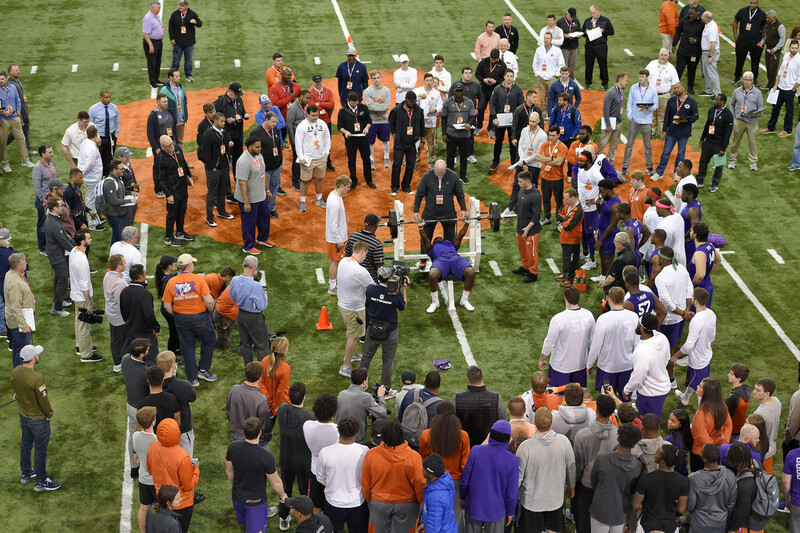 Published: March 14, 2019 at 05:39 p.m.
About a month and a half ahead of the 2019 NFL draft, scouts and coaches of NFL teams descend on Clemson, South Carolina as Clemson athletes demonstrate their abilities on the field. Take a look at some of the best moments of the 2019 Clemson Pro Day. Clemson running back Adam Choice bench presses during Clemson's Pro Day, Thursday, March 14, 2019, in Clemson, S.C.
Clemson defensive tackle Dexter Lawrence runs drills during Clemson's Pro Day Thursday, March 14, 2019, in Clemson, S.C.
Clemson defensive tackle Christian Wilkins runs drills during Clemson's Pro Day Thursday, March 14, 2019, in Clemson, S.C.
Clemson wide receiver Hunter Renfrow catches a pass during Clemson's Pro Day on Thursday, March 14, 2019, in Clemson, S.C.
Clemson defensive tackles Christian Wilkins, left, and Dexter Lawrence run during Clemson's Pro Day on Thursday, March 14, 2019, in Clemson, S.C.
Clemson running back Adam Choice runs the 40-yard dash during Clemson's Pro Day, Thursday, March 14, 2019, in Clemson, S.C.